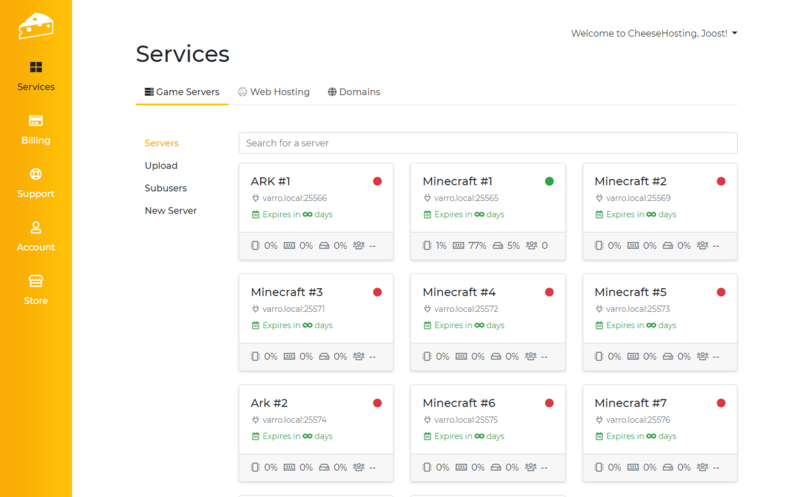 Game server and web hosting that's easy, fast and reliable. Stop paying for slots and waiting forever for support. Get started in just a few clicks. We won't waste any of your valuable game time. You'll always get a reply to a question within a few hours. We offer a reliable connection on a high-quality server for a very affordable price. No need to wait around. After your payment is in, you will get immediate access to your server. Playing games with friends is one of best things there is. We are extremely proud that we offer a platform on which we make this possible. With just a few clicks you and your friends can start your very own online adventure. After completing your order we immediately get to work. Your server will be created in a matter of seconds and you'll be able to manage it instantly in our panel. We have a well-trained support team whose priority it is to use their expertise to ensure that your server runs without a hitch. If you encounter any problems, they will be resolved in no-time. Vulcan is our very own web control panel. You can manage your server from your browser of choice anywhere in the world. In stark contrast to outdated panels such as Multicraft and TCadmin, Vulcan has a sleek, comprehensive, modern design and is constantly getting updated with new features.